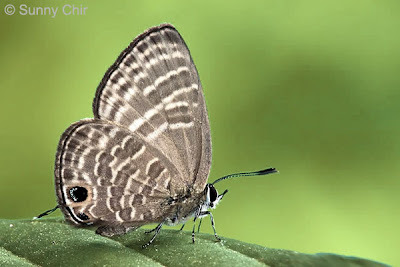 After our last re-discovery report on the Moth Butterfly, which raised the number of butterfly species found in Singapore to 288, this update adds on two more species to the Singapore Checklist. 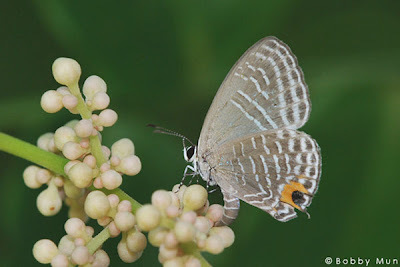 Both these Lycaenidae were originally listed in the database of species from the early authors based on their checklists found in Butterflies of the Malay Peninsula Edition 4 by Corbet & Pendlebury, and Butterflies of West Malaysia and Singapore by WA Fleming. 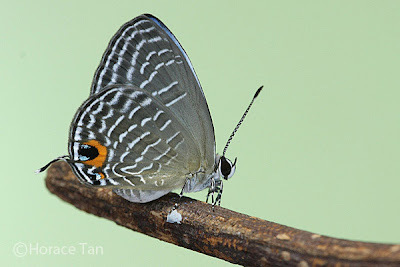 The reference checklists in C&P4 and Fleming's books form the baseline species checklists for butterflies of West Malaysia and Singapore. 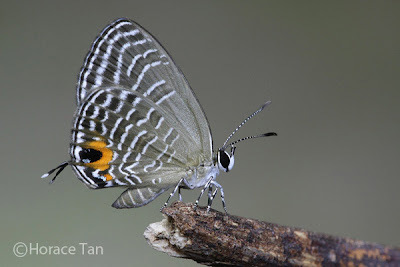 The journal article "Updating The Butterflies of the Malay Peninsula" in the Malayan Nature Journal in 2006, Vol 59 Part I, pages 1-49 records some of the more recent revisions. The first draft of this article was produced by Col JN Eliot just before his untimely death on 11 Apr 2003. The article was edited, enlarged and prepared for final publication by Henry Barlow, Richard Eliot, Laurence G Kirton and RI Vane-Wright - all experts in the field of butterflies of the region. This journal article adds to the baseline checklists and updates the more recent finds in Malaysia and Singapore in the later part of the 20th century and from 2000-2005. There has been some recent confusion in the number of species for Singapore, with various authors counting subspecies as well. Based on scientific taxonomic convention in documenting species checklists, this is obviously incorrect. A species is counted only once irrespective of how many subspecies it may have. There have also been uninformed amateurs who insist on using reference books which feature butterflies of other countries in the region e.g. 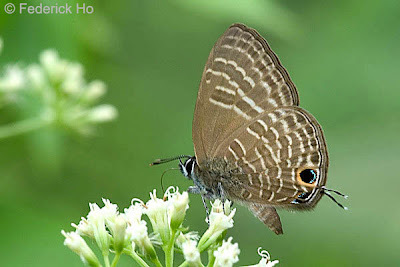 Butterflies of Thailand by Pisuth Ek-Amnuay, to baseline Singapore's species. This is obviously incorrect and misleading. The Thai book, which is an excellent reference for Thailand's butterfly fauna, is obviously not appropriate if used to identify Malaysian or Singaporean butterflies, in particular subspecies. 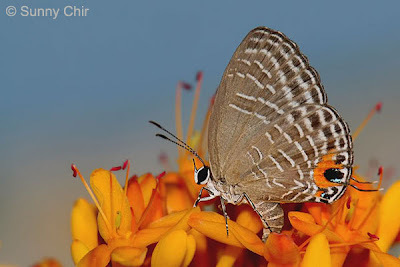 Recently, ButterflyCircle members re-discovered two species from the genus Jamides and Nacaduba. These two genera feature many lookalike species which are difficult to identify from field observations. Often, only with good photos and records of the early stages of the species can the species be positively identified. These two genera feature a number of species from the baseline checklists that have hitherto not been completely re-discovered. This is not to say that some of these species have gone extinct in Singapore, but merely a case of the difficulty of identifying them without proper scientific rigour. 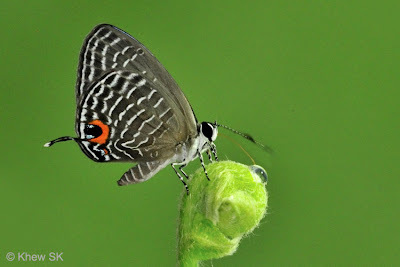 The genus Jamides features a number of species that are similar in appearance and difficult to identify when the butterflies are in flight. Occasionally, individuals are encountered puddling, ovipositing or feeding where good photos are possible, and from these, further confirmation can be made of the identity of the species. Better still, if the early stages are recorded and the caterpillars bred to adulthood. 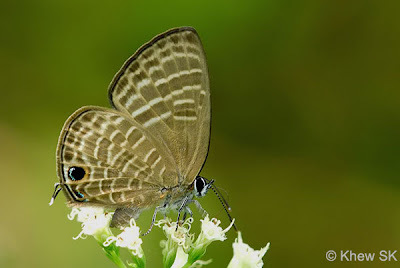 The male of the Glistening Caerulean (Jamides elpis pseudelpis) is described to be pale shining sky blue above, with the hindwing paler and the underside markings visible from above. The pale blue female has a more prominent black tornal spot which is sometimes faintly orange-crowned. This species belongs to the elpis sub-group of the Jamides, which is characterised by the post-discal band on the hindwing beneath being completely dislocated at vein 3. The species has a wingspan of about 27-30mm where the marginal border on the upperside a thread, and the hindwing bears no submarginal markings. The upperside forewing border of the female ends at the costa. 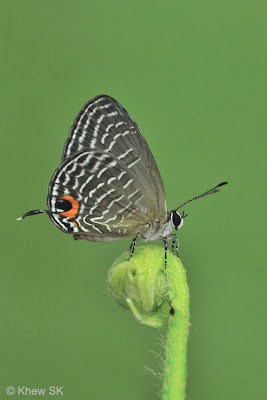 The Glistening Caerulean was re-discovered by ButterflyCircle member Sunny Chir, after reviewing a shot of a Jamides taken at an urban park, where females were observed ovipositing on the flowers of Saraca cauliflora with another closely- related species the Sky Blue (Jamides caeruleus caeruleus) whose caterpillars also feed on the same flowers. The early stages were recorded by ButterflyCircle member Horace Tan, and will be subject of a future blog life history article. The second rediscovery belongs to the genus Nacaduba - again another genus with many confusing lookalike species. When in flight, there is no way to distinguish the numerous species that exist in Singapore. However, this species' underside markings are unique enough to be able to render identification with a higher confidence if a well-taken photograph is available. 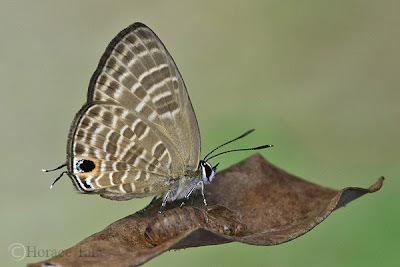 The Large Four Line Blue belongs to the pavana sub-group in the genus Nacaduba. This sub-group is characterised by the absence of the basal pair of lines on the forewing beneath. 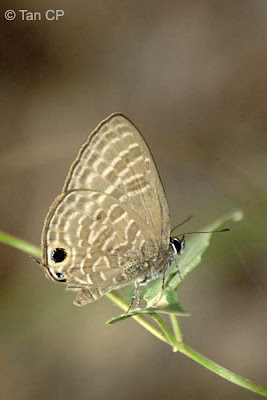 The Large Four Line Blue is described as the commonest species in the group, and where the underside stripes are broader and more diffuse that in any other species in the genus. The male of the Large Four Line Blue is purplish blue with marginal borders of about 1.0mm thick. 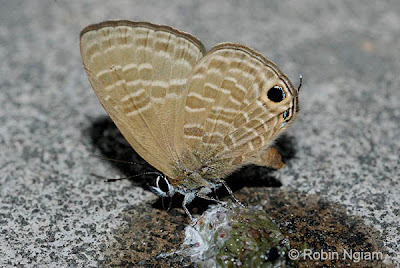 The female is pale blue with the distal portions almost whitish , and with broad black marginal borders of about 3-4mm thick. On the underside, the space between the post-discal straie are unicolourous and of the ground colour. The species has a wingspan ranging from 29-32mm. Both the males and females have a filamentous white-tipped tail at vein 2 of the hindwing. The Large Four Line Blue is a fast flyer, the male particularly so, but in the later hours of the day, it flies rapidly and perches on a favourite leaf or twig, returning time and again to the same perch after flying off. With these two re-discoveries, the Singapore Butterfly Checklist now reaches 290 species. In a forthcoming update, we will feature four more species - one of which is a new taxon for Singapore to further add to the Singapore Checklist. Special Acknowledgments : Dr Laurence Kirton of Forest Research Institute of Malaysia for confirming the ID of Jamides elpis.